Working from home is a delightful experience, but sometimes you just need to get out of the house. Whether you go to work on your business from a coffee shop or a coworking space, you want to make sure that the bag you choose to carry fits your needs. Today’s post will help you determine the perfect work bag by sharing the qualities of an excellent bag. These are things to consider before you purchase a bag, and where to find your next bag at. Price doesn’t always equate with quality. You can find a quality work bag no matter your budget. Here are some things that you should be looking for when determining which work bag to get. First and foremost, examine the material your work bag is made of. The material needs to be sturdy enough to carry what you need, whatever that happens to be. You wouldn’t want to place your $2,000 laptop in a work bag that isn’t sturdy. If you have the opportunity, try and test out the work bag before you purchase it. Definitely read reviews everywhere you can. Find out how people feel about the quality of the material. For example, do they feel comfortable placing their valuables inside the bag? Don’t judge a bag on just a few bad reviews. Rather use the reviews to gather data points. The reviews give insights into details that the description may have left out. An example would be like how large the laptop sleeve is or other odd quirks that you will relate too. Overall if the bag isn’t seen as being reliable or sturdy, you may want to move on to a different bag. Sometimes, you just need a bag that you can store an entire office in. If you plan to pack your bag full of stuff like your laptop, notebooks, chargers, makeup bags, etc. you have to go with a work bag that is spacious enough to hold everything. Carrying multiple bags to fit everything you need makes no sense. However, carrying extra designated bags inside a single larger bag to help keep things organized makes perfect sense. There are plenty of work bags and backpacks that will help you store everything securely. If you have a lot of stuff, look for work bags that have ample space for your necessities. You’d be surprised how much 2 extra liters holds in a bag. There is such a thing as too big of a bag. If you find yourself having a hard time carrying around your office on your back, now is the time to reassess. Get rid of the non-essentials and organize. Your work bag should help you stay organized. A spacious work bag is nice, but if it is just one big pocket, you will lose most of the small things you put in your bag. No one likes fishing around in their bag for their keys for 15 minutes. Instead, get a bag that has various zippered compartments for convenience. With a well-organized work bag, you can store small things like your earplugs, keys, and cards securely. Not only that, you will be able to access those items quickly, instead of letting them float to the bottom of your bag. Think about using multiple bags for better organization. There are bags specifically designed to hold things like chargers, backup batteries, and memory cards. Think of this like when you travel. There is a good reason why to have separate bags. So why limit yourself to only using extra bags to organize when traveling. Think of all of the opportunities there are to using extra organizing bags within your EDC bag. No matter if you have an entire office in your bag or just a few necessities, your bag should be easy to carry. If you are struggling to throw your bag over your shoulder, wheel it around, or carry it on your back your bag might not have the best features. A great work bag will help you distribute the weight of your bag evenly on your body. The handles or straps need to be well-designed, so you feel comfortable walking around. Read the reviews closely here. Find out if the straps are to close or too far. Maybe they pinch a specific body type. Work bags should make you feel comfortable and confident while they are in use. The last quality of a great work bag is style. We all have that item. You know the one we purchased that was outside of our style comfort zone. We got it why, because it was on sale of course. The price of the item was amazing, but we still don’t wear it because we hate the way it looks. Think about this with your work bag. It should be in the color and style that you like. Never settle for a work bag you don’t like just because it was on sale. You will likely be wearing this work bag a lot, so you want to make sure that you love wearing it. Now that we know the qualities of a great work bag, what are some questions we should consider before purchasing a work bag? This section will help you break down these questions so you can pick the best work bag for you. What Do You Plan To Put In Your Work Bag? We want our bag to be spacious, but only as spacious as it needs to be. If you just plan to bring a notebook, a tablet, and your keys to work outside your home your bag won’t need to be that big. On the other hand, if you want to bring a mini version of your home office, you need a bag that can handle the job. Think about what you usually bring with you when you leave your office. Now, ask yourself if you really need these items or are they just convenient. Once you land on a final decision select a bag that is right for your needs. How Often Will You Be Using A Work Bag? Using a bag daily will cause it deteriorates faster. When picking a bag for every day carry, you want to invest in a higher quality bag. The investment will pay for itself. This is a bag you will be using daily versus a bag that you will only use a couple of times a month. When you invest in that higher quality bag, you should be able to expect that it will be a part of your on the go rotation with no worry of having a failure. Do your self a favor here. Do some research, read reviews, and look for a quality long-term bag with a warranty. Where Will You Be Taking Your Work Bag? Most people plan to work from a coffee shop or spend time at a coworking space. Your bag won’t be subjected to much from a coffee shop. Now, are you one of the lucky few who will work from the beach? If you are exposing your bag to dirt, the sun, or other outside factors, though, you will have to consider that when purchasing a bag. You may not want to take just any bag to work at the beach, after all. Will You Feel Comfortable Wearing The Bag Often? This question goes back to the point we talked about earlier when it comes to a work bag being easy to carry. Even the most expensive bags can be annoying to take on the go. For example, some people swear by over the shoulder bags and some people would rather carry a backpack. Think about the style of work bag that you would like to carry on an everyday basis. What Price Am I Willing To Pay For A Quality Bag? Last, you must consider the price that you are willing to pay. Cutting down the cost that you are willing to pay for your work bag will considerably limit your choices but in a good way. Having that limit helps makes the process of picking your bag way easier. Once you know that you only want to spend up to $150 on a bag, you can cut out work bags that are more expensive. Cutting out the noise is important when it comes to picking a work bag because it seems like new options are popping up every day. All these options can make the simple process of choosing a work bag very overwhelming even though it doesn’t need to be. When looking for a work bag, one of the best things you can do is go in-store. Being able to feel the quality of the bag, see the inside compartments up close, etc. will help you make a great decision. Alas, shopping on different websites also gives you the power to see what else is out there. You can go beyond what is “in stock”. 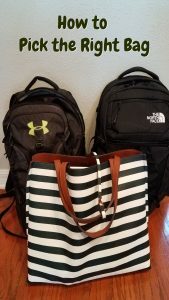 Here are a couple of sites that you can go to for work bags. Amazon: Amazon is an obvious option for work bags. They have a variety of work bags available from various sellers at different price points. This is great if you want to explore many different types, prices, and styles of work bags. Amazon also has a robust reviewing system so you will likely be able to see tons of reviews and pictures from customers who have the bag you want. Nordstrom: Nordstrom is a great site to go to for higher priced worked bags. A lot of their work bag selection is in the $100+ range by brands like Tory Burch, Madewell, Saint Laurent, and Marc Jacobs. If you are into brand names, they have a great selection. Incase: Incase has a great line of work bags that are dedicated to being able to hold all the technology that you need to bring with you. They are a bit pricier with most of their bags in the $100+ range, but their bags have your technology in mind which is great if you are taking a lot of technical things with you on the go. eBay: eBay has a huge selection of bags. One concern may be the authenticity of a bag and the lack of a real review system. If you know the exact bag you want and can find it on eBay, this can be a great money saver. Don’t forget to follow your personal style and make sure it is easy to carry. Your work bag can become a trusted part of your daily look. So, take your time selecting a work bag. With the tips in today’s article, you have a lot to consider as you are buying a work bag. Hopefully some of these tips and advice, your next backpack or bag purchase will be a breeze.